The Filter Builder app provides a graphical user interface to design filters using the fdesign object. The first step is to choose the filter response. Based on the response you choose, the algorithm, constraints, and the design parameter settings appear on the Main tab of the user interface. You can further specify the precision and data types in the Data Types tab. The Code Generation tab contains options for various implementations of the completed filter design. Once you specify all the filter parameters and the design algorithm, you can visualize the filter response by clicking on the View Filter Response button. When you click on this button, fvtool opens to display the magnitude response of the filter. When you have achieved the desired filter response through iterations of design and analysis, click OK. When you click OK, the app exports the filter object to the base workspace. If you select the Use a System object to implement filter check box in the user interface, the app exports a filter System object™. For more information on the design process using the Filter Builder app, see Filter Builder Design Process. For details on each of the response methods and settings of all the associated parameters, see filterBuilder. MATLAB command prompt: Enter filterBuilder. MATLAB command prompt: Enter filterBuilder(obj), where obj is an existing filter object. For example, if obj is a bandpass filter, filterBuilder(obj) opens the bandpass filter design dialog. The obj object must have been created using filterBuilder or using fdesign. MATLAB command prompt: Enter filterBuilder('response') to replace response with a supported response method. 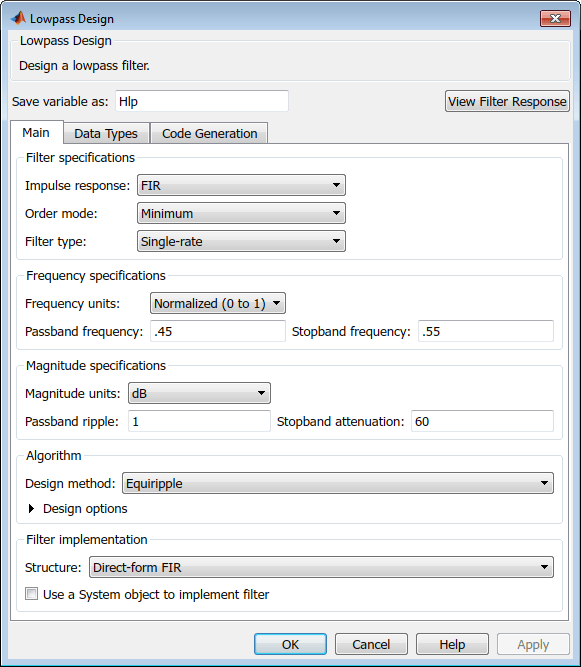 MATLAB opens a filter design dialog that corresponds to the specified response. For details on the supported response methods, see filterBuilder.